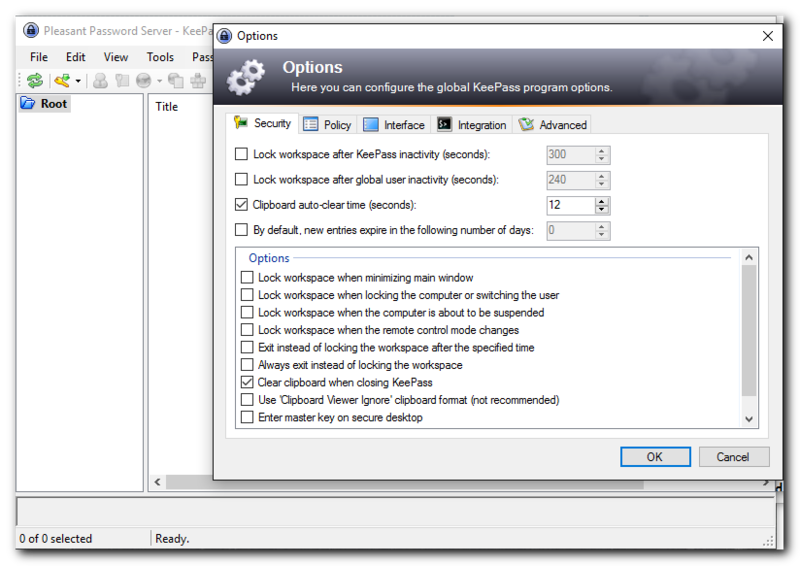 You can control which options are enabled/disabled for Users and Roles in the KeePass for Pleasant Password Server application, by creating Enforced Configuration files. This functionality was designed to be very flexible and powerful: it provides the ability to edit and import a full KeePass config file, and then apply it to various users/roles. Can apply to either an individual User or to an entire group of people in a Role. Which applies to a particular User: always take presedence over any other Rules applied. When applied to a Role: can decide which Rule is applied first. Only one Enforced Configuration file will be applied at a time. In KeePass select File > Export Configuration. In the Web Client import this file on the Advanced -> Client Configuration page. Rename the file by clicking Edit. Apply this file to Roles or Users. Below the upload button, a table displaying all the enforced configuration files you have uploaded will be displayed. You can rename your configuration file here. Click Add new record at the top of the table in the User Rules section. Click Add new record at the top of the table in the Role Rules section. Click on the drop down in the second column and select a Role to apply your config file to. if you select Everyone your config file will apply to everyone, regardless of their role. Click on the drop down in the 4th column and select the config file you've uploaded. Sort order is for when two different config files may apply to a given user in an given role. The Config file with the lowest Sort Order will be selected. If you wanted to prevent your entire password database from being very easily leaked, you probably want to disabled the print and export features of KeePass for Pleasant Password Server. Open up the options window. This can be found by navigating and clicking on Tools > Options in the menu bar. Using the drop down list in the last column, select the Config file you just uploaded. You've successfully created a config rule that will prevent users from printing or exporting all of the passwords they have access to.